Z3 Play is Motorola latest smartphone in the Z series that just launched in Brazil. The new device has a glass front and back with aluminium lining and is splash-resistant like most Moto smartphones, thanks to its p2i coating. It has a slim body profile of 6.7mm while the overall weight is 156 grams. The Moto Z3 Play runs Android 8.1 Oreo out-of-the-box. It features a 6-inch Super AMOLED capacitive touch display with Full HD+ (2160p) resolution, Corning Gorilla Glass protection, and underneath the display is an octa-core Qualcomm Snapdragon 636 Mobile Platform clocked at 1.8GHz, coupled with 4GB of RAM and Adreno 509 GPU. There is a 32GB of storage onboard that can be expanded up to 2TB via MicroSD card. The company also provide a 64GB storage model. At the front is an 8-megapixel camera with an f/2.0 aperture, while a 12-megapixel f/1.7 camera is equipped at the back alongside with a secondary 5-megapixel f/2.2 camera for capturing depth of field. Beside the camera is a dual-tone LED flash. 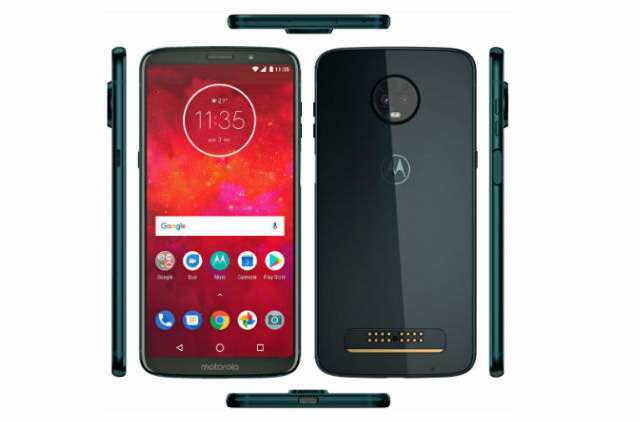 The Moto Z3 Play comes equipped with a side-mounted fingerprint sensor for smart security and front-ported speaker. It also has four far-field microphones. Connectivity options provided includes 4G VoLTE, Bluetooth 5 LE, WiFi 802.11ac dual band, GPS, NFC, and USB Type-C. It is fuelled by a 3000mAh battery with Turbo Charge fast charging. It has supports for Moto Mod accessories but lack a 3.5mm audio jack. The phone will be available in Deep Indigo Blue and will cost R$ 2,299 (US$601) when it go on sale in Brazil later this month. It will come to the U.S and Canada in the Summer.